Below are common attributes associated to Crimson Queen Japanese Maple. Become a care taker for Crimson Queen Japanese Maple! Below are member comments regarding how to plant Crimson Queen Japanese Maple. No comments have been posted regarding how to plant Crimson Queen Japanese Maple. Be the first! Do you know how to plant Crimson Queen Japanese Maple? Below are member comments regarding how to prune Crimson Queen Japanese Maple. No comments have been posted regarding how to prune Crimson Queen Japanese Maple. Be the first! Do you know how to prune Crimson Queen Japanese Maple? Below are member comments regarding how to fertilize Crimson Queen Japanese Maple. No comments have been posted regarding how to fertilize Crimson Queen Japanese Maple. Be the first! Do you know how to fertlize and water Crimson Queen Japanese Maple? Below are member comments regarding how to deal with Crimson Queen Japanese Maple's pests and problems. No comments have been posted regarding how to deal with Crimson Queen Japanese Maple's pests and problems. Be the first! Do you know how to deal with pests and problems with Crimson Queen Japanese Maple? Looking for Crimson Queen Japanese Maple? Get Crimson Queen Japanese Maple fresh and large directly from the grower to your garden! Buy Crimson Queen Japanese Maple online from the nursery wholesalers and save BIG! Plant the the Crimson Queen Japanese maple in sites that provide most any type of well-drained soil. Wet soggy soil around the roots is a killer. Crimson Queen can grow in a wide range of soil pH preferring a slightly acidic soil. Japanese maples will grow in sun or shade but, in the deep South, they benefit from some afternoon shade. In their natural habitat, Japanese maples are understory trees, growing in dappled forest sunlight and at the edges of woodlands. Ideally they prefer to be grown in similar conditions. Bright sunlight and hot summers do not kill trees, but in hot summer areas, the newest leaves may burn and scald when exposed to full, all-day sun. In the deep South, where the sun is stronger during summer, they benefit from some afternoon shade. Japanese maples stand out best when they are planted as a single specimen. Use them to accentuate an entryway or as a focal point to draw attention to a certain area of the landscape or home. Don't plant them too close to other trees or large shrubs that might overcrowd them in the future. Underplant them with low growing shrubs or groundcovers. To plant a Japanese maple, dig a hole no deeper than the root ball and two to three times the width of the root ball and fill it with water. If the hole drains within a few hours, you have good drainage. If the water is still standing 12 hours later, improve the drainage in your bed, perhaps by establishing a mound to plant your tree in. Turn and break up the soil removed from the planting hole. If the native soil is dense, compacted or heavy clay mix in a good organic compost or soil amendment at a 30/70 ratio with the soil removed from the hole. Remove your plant from its container and carefully but firmly loosen the roots around the exterior of the root ball. Set the plant into the hole you've prepared, making sure the top of the root ball is slightly above the soil level (1/3 of the rootball above the ground if planting on level ground) to allow for settling. Pull your backfill soil mixture around the root ball in the hole, tamping as you go to remove air pockets. When planting on level ground, and your rootball is higher above the ground, taper your backfill soil mixture from the top edge of the rootball gradually towards the grade. Do not place any backfill mixture on the top of the rootball. Water thoroughly and cover with a one to two-inch layer of mulch. In high wind areas, stake taller trees for a year if necessary. There are various methods for pruning Japanese maples, however, when properly located in the garden they don't usually require anything more than a light, corrective pruning of a stray branch here or there. Light pruning can be be performed at any time of year other than during Spring when the sap is rising. If your Japanese maple has grown beyond the boundaries of the area it was intended to fill, major pruning may be necessary. Major pruning should only be performed during the dormant season (Winter), after the leaves have fallen and prior to leaf production in the Spring. If you just can't get up the nerve to prune a Japanese maple that needs pruning, call your local certified arborist. Japanese maples are not heavy feeders however will benefit from fertilization. I fertilize my Japanese maples after new growth has emerged in spring with a slow-release, well-balanced shrub & tree type fertilizer. Alternatively, you can use a mild organic or natural fertilizer. Insect Problems - With the exception of the Japanese beetle, that causes very little if any damage, Japanese maples are not prone to insect problems. If you feel that you must spray for Japanese beetles do so using a light mix of Liquid Sevin spray. Spray early in the morning to allow solution to dry on leaves before the sun is too high. Disease Problems - Provided soil is well-drained, and the plant is properly irrigated, Japanese maples are not prone to disease problems. Consistently wet or soggy soil can cause serious problems with the roots. 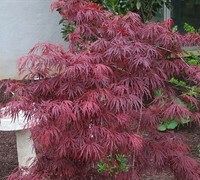 Always plant japanese maples in well-drained sites and soil. Pest Problems - Deer don't like Japanese maples.